Reverend Byron C. Stevenson is the Senior Pastor and Founder of The Fort Bend Church in Sugar Land, Texas. Under his visionary leadership, The Fort Bend Church opened its doors for its inaugural worship service in a small cafeteria at Sugar Land Middle School on August 1, 2004. Over 600 individuals were in attendance. Since that time over 7,000 members are now a part of this phenomenal ministry. In 2013, Outreach Magazine tabbed The Fort Bend Church as one of the Top 100 Fastest Growing Churches in America. In addition, The Houston Forward Times newspaper recognized Pastor Stevenson with its prestigious designation as one of Houston’s Visionary Pastors of 2013. A native of Baton Rouge, Louisiana, Pastor Stevenson is a graduate of Southern University and A&M College with a Bachelor of Science degree in Accounting. He also earned a Masters of Arts degree in Theological Studies from Houston Baptist University. Pastor Stevenson is also a Certified School Business Manager. After working in Corporate Accounting and Auditing for many years, Pastor Stevenson accepted God’s call to ministry and preached his first sermon in July 1994. After 10 years in ministry, Pastor Stevenson founded The Fort Bend Church on five pillars: trust, faith, kindness, compassion and liberal giving. It was through the liberal hearts of the members of TFBC that Pastor Stevenson successfully led the church to purchase 6.3 acres of land in Sugar Land, Texas after being in existence only nine months. Since that time Pastor Stevenson has led the church in several capital campaigns resulting in the completion of a new 61,000 square feet worship center which opened in March of 2009. As a result of tremendous numerical growth, the church purchased an additional 6.8 acres in 2013 for a multi-phase parking and facility expansion project. Pastor Stevenson’s desire is for the church to live up to its motto of “Serving the total needs of God’s people”. Based on that motto, The Fort Bend Church currently offers over 40 ministries for men and women of all ages. Pastor Stevenson currently leads a dynamic staff of 40 full and part-time individuals uniquely gifted to serve God’s people. 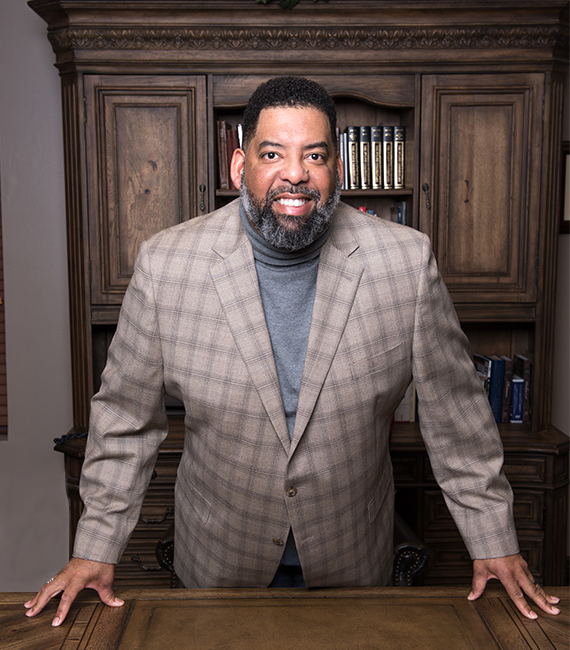 As a community leader, Pastor Stevenson has served on several boards including the Executive Board of the Baptist General Convention of Texas and the Houston Area Urban League where he currently serves as Chairman of the Audit Committee. He is a member of Alpha Phi Alpha Fraternity, Inc. and a life member of the Southern University Alumni Association. His ministry travels have taken him to various parts of the world including Cairo, Egypt, Rome, Italy, Jerusalem, Ammon Jordan and Bethlehem. He is married to his high school sweetheart, Sonya Taylor Stevenson. They are the proud parents of two daughters, Claire Alexandra and Cydney Victoria.